The second way is how the time traveler knows his theories and will consciously avoid trying to do anything that might affect the future. (The Final Countdown which I reviewed last year is a great example). In these kinds of stories, the time travelers will make great efforts to keep the past fluid (or as fluid as possible, since, after all, their mere presence must have SOME impact, even if the story refuses to acknowledge it). But the various methods of time travel are not limited to just your basic machine that is designed explicitly for that purpose. One of the best places to see a nice array of time travel theories is in the Star Trek Universe. In the episode of the original series' Tomorrow is Yesterday, as well as in Star Trek IV: The Voyage Home, the Enterprise used the sun and a "slingshot theory" (basically using the gravity of the sun) to propel the ship through time. Other methods included the two varied attempts in today's entry. Captain Kirk (William Shatner) and company are mapping out a course on a planet that puts the Enterprise through a rough time. The Enterprise rocks through several tremors, one of which causes the control panel to explode near Sulu (George Takei), knocking him unconscious. Dr. McCoy (DeForest Kelley) is summoned and administers a drug to revive him, but during another tremor accidentally injects himself with an overdose of the drug. This causes him to become wildly unpredictable and he escapes to the surface of the planet. An away team is formed to follow him and bring him back. On the planet the crew find a strange rock formation which after a time, becomes active and identifies itself as "The Guardian of Forever". Essentially it is a time travel device. (At this point you may wonder why a device on a remote planet is essentially only a time travel device for the history of Earth. After all, Spock is not an Earthling, even if he is ½ human. But the device only show's Earth's history, not the history of Vulcan. Did Vulcan not have a history?) McCoy, who is still mentally unstable escapes though the device into the past, and immediately the rest of the crew find themselves stranded unable to contact the Enterprise. They deduce that somehow McCoy has done something in the past that he entered and altered history, in such a dramatic way that the crew's mission was never started. Spock (Leonard Nimoy) and Kirk decide they have to enter the time travel device and try to prevent McCoy from doing whatever it was he did that altered history. 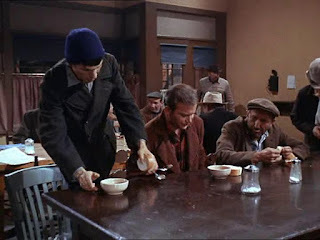 They enter the device and end up in Depression era San Francisco, where they pose as unemployed, homeless men while they search for McCoy. 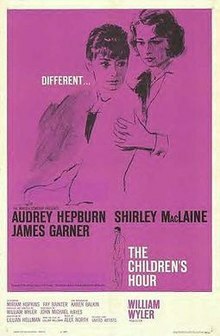 The pair try to blend in, becoming citizens of the time era, and in the process encounter Edith Keeler (Joan Collins), a director of a shelter that feeds homeless and unemployed men of the time. 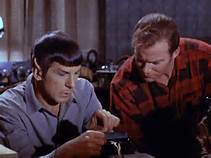 Spock works on trying to find out exactly what point McCoy changed history using "knives and bearskins" (essentially early 20th century technology which consisted of tubes and circuits to create a machine to allow him to review the events he recorded earlier on his tricorder before the event happened, while still on the planet). 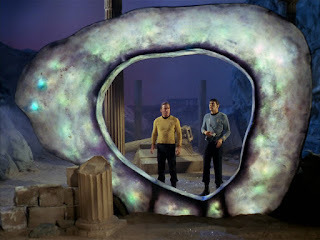 Kirk, in the meantime develops a relationship with Edith, which becomes a problem as Spock determines that what McCoy must have done involves her. When he finally gets his primitive machine to work he gets two different images: One an obituary of Edith Keeler, and another a meeting between Keeler and the President of the United States 6 years into the future of where they are. 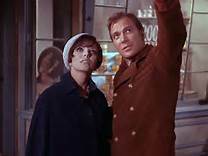 Spock deduces from the images that McCoy must have saved Edith's life, and she was instrumental in a peace mission that delayed the U.S.'s entry into WWII, the domino effect of which was that Hitler and the Nazis won WWII. Kirk and company have an ulterior motive to righting the wrong caused by McCoy's interference with the timeline, of course. 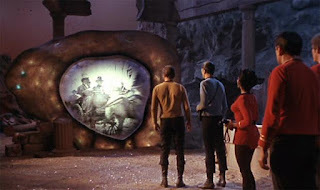 (The away team will either be stranded on the planet, or as Kirk suggests, if he and Spock don't succeed, the crew will enter the device and start a new life in the past.) 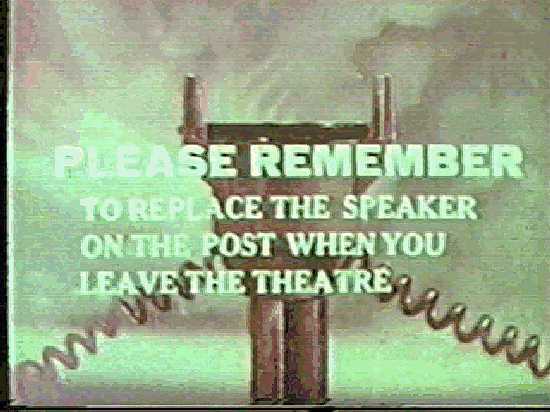 But the original series had a desire to not let the past be influenced by knowledge of he present. It was the same way with the episode of "Tomorrow is Yesterday", in which a 1960's era jet pilot is introduced to the future through some extenuating circumstances. The crew made sure they resolved the problem by sending him back without leaving him with knowledge of how the future turned out. But as we shall see, future Enterprise crews were not so reluctant to have people from the past left with such knowledge. Star Trek The Next Generation: "Time's Arrow"
Captain Jean-Luc Picard (Patrick Stewart) and his crew are called to Earth where an astounding discovery has been made. 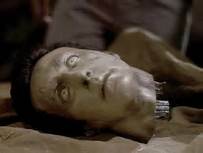 Deep in a mine that has not been disturbed for over 500 years (since the late 1880's by this timeline), excavators have discovered, among other things, the head of the Enterprise's resident android, Data (Brent Spiner). This episode is one of the more intriguing ones of Star Trek: The Next Generation. The cavern is replete with something called "triolic waves", a phenomenon that is not normally found on Earth. Also, after examining artifacts, they find a cellular fossil which leads them to the only planet in the galaxy that is home to this particular organism. While there, they find a separate cavern that is replete with the phenomenon of triolic waves. Data, using his android abilities, is able to determine that there are people there, albeit at a infinitesimally small deviation in time (.004 seconds). Using a device that he creates and his own positronic brain, Data is able to move himself into that altered time phase, where he encounters two members of an alien race, and is transported back to San Francisco, circa 1880. 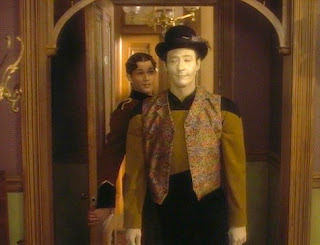 Data immediately begins to work at trying to resolve his problem, while the rest of the crew tries to find a way to follow him into the timeline. 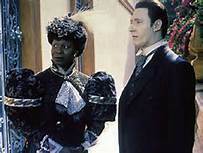 Data, for his part, enlists the help of Guinan (Whoopi Goldberg), who as a member of a long-lived alien race, is, at that point, still unaware of the future relationships with the members of the crew of the Enterprise. But she, as is typical of her, manages to take it in stride and help Data. 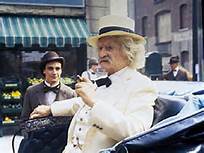 They are hampered, however, by an extremely inquisitive Samuel Clemens (Jerry Hardin), also known as the famous author Mark Twain. In fact, Clemens becomes aware that Data is from the future, and tries to stop him from what he believes is an intention to interfere with the past, his present. The crew resolves the issue adequately, but in the process, Clemens is introduced to the crew and starship. And here is that niggling little faux pas I hinted at earlier. The episode ends with Clemens still knowing about the future. The crew did not even address the issue of what might happen with someone of the past continuing on with a knowledge of the future. 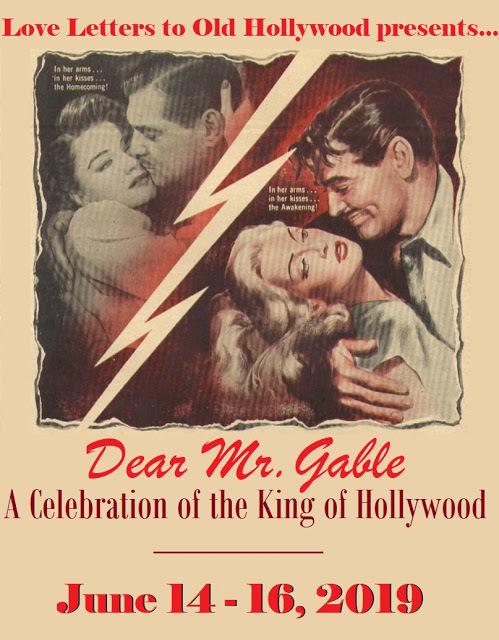 Of course, it could have been easily resolved, I think, by just stating that he would never be believed, and since he was a writer and it would be taken as just more flights of fancy from an imaginative mind, but even that was not proposed. 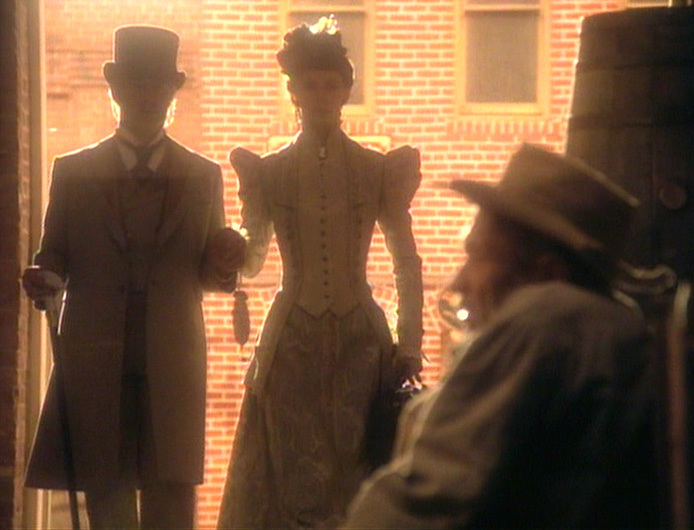 Still, despite this little lapse in the scriptwriters' story, it remains one of the best episodes of the series. Time travel has always been a popular dream. 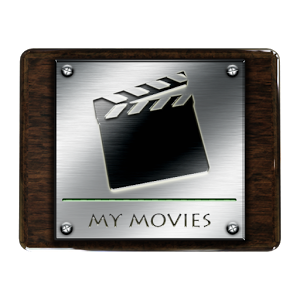 I rather treat movies and TV as if they are my own personal WABAC machine. It is intriguing how different writers and programs deal with the premise and I found your double bill to be an excellent escape. 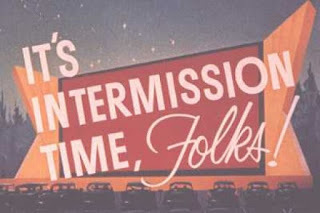 One of these days I may dedicate an entry to discussing time travel in detail and how the movies either take valid hypotheses of it's possibilities or ignore them altogether in favor of the story. I'm afraid I might get to technical for a movie blog, but I read pseudo-science with as much interest as I do history. Thanks for the good words. Thanks for this excellent look at two of the Trek franchise's most interesting journeys in time! Should have added Deep Space 9's "Little Green Men" (where Quark and a couple of other Ferengi end up in Roswell NM circa 1947; the famed crash site) to the mix. Maybe next year. Thanks for reading. I have always loved time travel stories, and "City on the Edge of Forever" is one of my favourite episodes of the original series. For that matter "Little Green Men" is one of my favourite DS9 episodes. 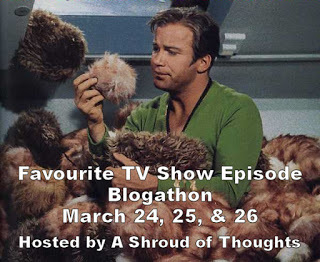 Thank you so much for participating in the blogathon! Thanks for reading. It was fun. Like I say, I may do Little Green Men (and another yet to be named time travel themed Star Trek) next year. I started watching Star Trek recently after watching the Chris Pine movies. 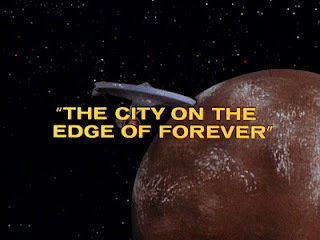 I just have a couple episodes to go get to City on the Edge of Forever. Have you seen Timeless? 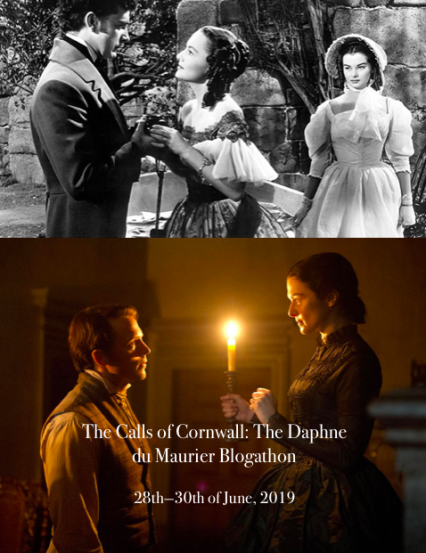 It just finished its first season and combines history and time travel. It's a top notch show (I don't watch a whole lot of modern tv). If you haven't seen it you should definitely check it out. It's on the NBC website. Ohhhhhhhh, how I love The City on the Edge of Forever. I consider it the very best episode of ST:TOS. As I say, time travel will always attract my attention. I even liked the time travel aspect of "The Voyage Home", even if the environmentalist aspect of it grated on me.